Jaipur : The Hindi bestsellers list for Q3 October –December 2017 was released by Namita Gokhale – eminent author and co-director Jaipur Literature Festival ,Sanjoy Roy – MD, Teamwork Arts and Producer Jaipur Literature and Vishnu Tripathi, senior editor, Jagran Prakashan Group, today at 11th Zee Jaipur Literature Festival which starts from today in pink city Jaipur. Dainik Jagran Nielsen Bookscan Bestseller list released in three categories Fiction , Non-Fiction and Translation . This was followed by a discussion on the impact of Dainik Jagran Hindi Bestseller list on the literary community. The panel included Alka Saraogi , Chitra Mudgal and Anant Vijay. 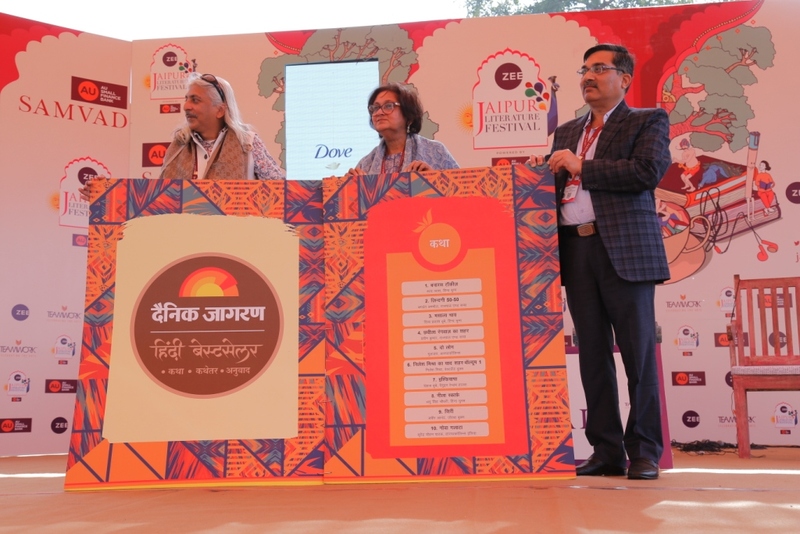 In this third trimester, in adult fiction category young writer Satya Vyas ‘Banaras Talkies’ ,adult non fiction category, Writer Narendra Kohli ‘ Vyangya Samay and in translation writer Chitra Banerjee Divakaruni’s book ‘Draupadi Ki Mahabharat’ crown the lists. Apart from these, writer and lyricist Gulzar’s book ‘Do Log’ lyricist Javed Akhtar’s Lava, Cricket legend Sachin Tendulkar autobiography ‘Sachin Tendulkar-Meri Aatmkatha’ actress Twinkle Khanna’s ‘Mrs.Funnybones’ and Amish Tripathi‘s four books ‘Sita Mithila ki Yoddha’ ‘Nagaon Ka Rahasya’ (“The Secret of the Nagas”) “Vayuputron Ki Shapath” (“The Oath of The Vayuputras”), “Ikshvaku Ke Vanshaj“, (“Scion of Ikshvaku“) and Devdutt Pattanaik ‘Meri Sita’ in the list. The bestseller not only includes popular Hindi writers and books but some popular English authors too who have won over Hindi readers, as seen in the translation category. World renowned Neilsen BookScan is instrumental in the selection process of the Hindi Bestseller list.Also the list includes those books whose first version was published on and after January 1, 2011 and which has 13 digit valid ISBN numbers. Dainik Jagran Hindi Bestseller is the first initiative of its kind, bringing in the Best Seller list in Hindi. Earlier there was no transparent and credible means to accurately assed the popularity of Hindi books. Dainik Jagran Nielsen Bookscan Bestseller list will be released every quarter of the year. This initiative is part of Dainik Jagran’s campaign ‘Hindi hain hum’.